Nick Peterson dives into the pool. The senior and the Wildcats lost to Georgia and Georgia Tech over the weekend. Despite season bests from several swimmers, Northwestern lost handily in two meets this weekend, falling 174-109 to No. 8 Georgia on Friday and 209-85 to Georgia Tech on Saturday. Against the Bulldogs (4-0), the Wildcats (0-3) failed to place first in a single competitive event. 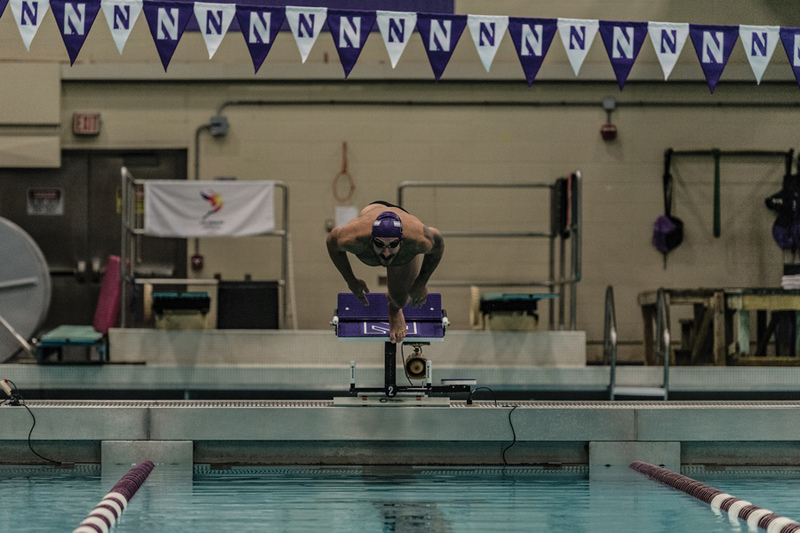 NU took second and third in the 200-yard medley relay and got individual second-place finishes from senior Almog Olshtein in the 50-yard freestyle, junior Ryan Tate in the 100 free and junior Tyler Lis in the 200-yard backstroke. Had the last four events counted toward Georgia’s final score, the differential would have been worse for the Cats. Because the Bulldogs counted the closing events as exhibitions, NU received all available points. The Cats did, however, better their times in 10 events from their season-opening loss at Eastern Michigan. Olshtein credited part of NU’s improved performance to their home advantage. He said there were no surprises for the swimmers because they were familiar with the blocks. Though the score was more lopsided, the Cats enjoyed more first-place finishes against the Yellow Jackets (2-1) the next day. NU got first-place finishes from freshman DJ Hwang in the 1,000 free, junior Jack Thorne in the 100 back and freshman Liam Gately in the 500 free. Each earned the Cats nine points with his win. The Saturday meet was both teams’ second in as many days. Gately said NU’s swimmers will have to learn to overcome their exhaustion, but that swimming back-to-back will get easier as they gain more experience. Overall, though, NU could not keep up with its weekend opponents. Both Georgia and Georgia Tech swept the diving events, with the Cats’ lone rostered diver, junior Ben Magliato, still sidelined with a concussion. Despite the results, the losses offered several positives for the Cats to build on, particularly with the freshmen in the distance freestyle events.